Lanhydrock House and Gardens near Bodmin is one of the most beautiful national trust properties in Cornwall. The House and Gardens are a must – see all year round attraction, superbly set in wooded parkland of 1,000 acres and encircled by a garden of rare shrubs and trees. Bodmin Moor is the highest area of Cornwall and is full of granite tors including Rough Tor and Brown Willy, Cornwall’s highest point. The Moor lends itself to lovely walks with it’s remote rugged scenery. Jamaica Inn, situated in the middle of Bodmin Moor near Bolventor was made famous by Daphne du Maurier’s novel. The Inn also contains a small smuggling museum and a room devoted to du Maurier. 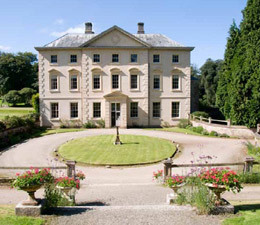 Less than a 10 minute drive from The Camel Trail Tea Garden is Pencarrow House.For nearly 500 years Pencarrow has been the much loved home of the Molesworth - St Aubyns, ever since John Molesworth arrived from Northamptonshire to become the auditor for the Duchy of Cornwall and Queen Elizabeth 1. Still owned by his descendants, Pencarrow is anything but a museum. Family photos, children's toys,hats on classical busts and the pet dog Oscar bring this Cornish Mansion alive and allow you a glimpse of what it's like to live surrounded by so much history. The 50 acres of gardens include the Italian Gardens, lovely lawns with magnificent specimen trees,woodland walks and lots of flowering plants and shrubs.